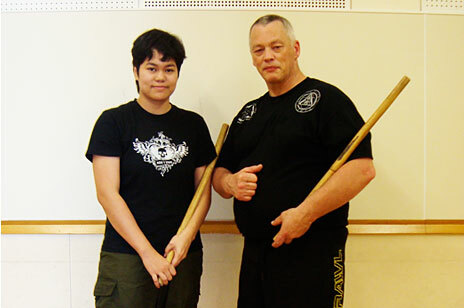 Philip Gelinas (born in 1952) is a martial arts practitioner who lives in Montreal, Quebec. He owns and runs the Gelinas Academy of Mixed Martial Arts (GAMMA), also known as the Cultural Martial Arts Academy. He is one of the founding Dog Brothers as well as one of the founders of the Brazilian Top Team Canada network of Brazilian Jiu Jitsu Academies in Canada. Gelinas began his training in a style of karate known as Chito Ryu at the age of 14. Since then he has trained in many styles including Brazilian Jiu Jitsu, Kali, Muay Thai, Judo, Kempo, Kajukenbo, Jun Fan-Jeet kune do, Silat, and Capoeira. He obtained black belts in Kempo (1973) and Kajukenbo (1975). In the 1980s he received a Muay Thai instructor credential under Tom Harink after meeting him in 1985.